Out in the arid plains outside of Amman you will find many stand-alone castles, structures with a mystique unlike any other. This is one of the more famous ones, and also one of the most photogenic. It's not certain what the original purpose of this castle used to be and even though it looks huge it might not have been used as a defensive establishment. In the courtyard, a mess of arches and windows, you will find around 60 rooms. The inside is much smaller in size than the appearance outside might suggest. You can climb up to the second floor. In one of the rooms you will find Arabic inscriptions which helped modern historians to determine the age of the structure. The admission ticket is also valid for entry to Qusayr Amra & Qasr Al-Azraq. How popular is Qasr Al-kharanah? People normally club together Al Balad - Downtown Amman and Cave Of The Seven Sleepers while planning their visit to Qasr Al-kharanah. The first of the three desert castles and in the past it was a motel for the merchants with their camels and precious merchandise. 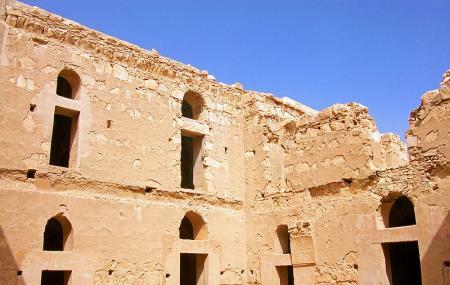 Qasr Al-Kharaneh, which is well preserved/renovated and has a stunning look from the outside. Popping up in the middle of nothing, I always wonder, who created those places and what the purpose was. Reading some explanations, it seems that scholars until now are not 100% sure, although of course, some assumption exist. It is believed to be built before the 8th century and an example of early Islamic architecture although it has several different influences. There is courtyard inside and you can go upstairs and basically walk around the whole castles once. It is also the most well-known castle and probably biggest of the desert castles. On your way to Qasr Omera, stop by at Qasr alkharaneh. It a good example of how far was the architecture science at the Ommyad Era.